Nestled between luxuriant hillside gardens and the glistening turquoise waters of the Caribbean, this modern-day Garden of Eden features villa suites with private pools. Amenities include championship golf, a renowned scuba program and 15 world-class restaurants. The property also includes 9 bars, seven pools and 22 whirlpools, plus two fitness centers. 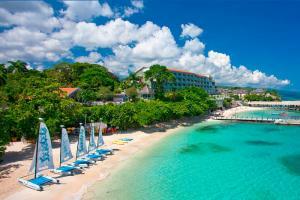 Beachfront in Ocho Rios; 1 hr and 45 minutes from the airport. Bayside Restaurant - International selections; Valentino's Restaurant - Northern Italian; Arizona Restaurant - Western-style grill. Blue Mountain, Coyaba Botanical Gardens, Dolphin Cove, Dunns River Falls, Fern Gully, Green Grotto Caves, Horseback Riding, Martha Brae River Rafting, Port Antonio.